Delaney BBQ | Oh No! Not Another NYC Food Blog! The eventual outcome of running a hotly successful underground BBQ brisket operation – walls. Located on the quiet side of Williamsburg. Brisket – a big, beautiful mix of fatty and lean portions. Fabulous brisket – not quite as great as Fette Sau, but we are admittedly biased. If we’re talking straight beef and not adding pig into the equation, it’s a really close race if not a dead heat. Stellar greens – vinegary enough I wasn’t left wanting and deeply flavorful. The greens made my day. Nice cheese – a Comte. Potato bread was available on the side board, as much as you want. Simple rustic decor with exposed brick, whitewashed benches and Americana on the shelves. Dominated by a neon cow at a nice relaxing quarter light power. Order at the counter. They’re busy, but take the time to do a great cutting job and are friendly. 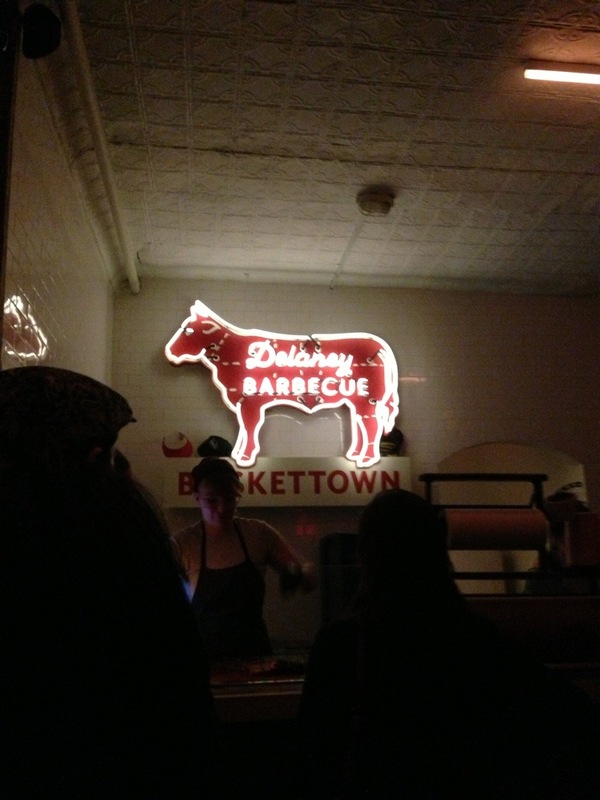 This is a great place for some brisket. And I’m not just saying that because of the free take home drink koozie. 4 out of 5 for very good brisket. They know what they do, and they do it well.